Pottery, relief, 0.5L, figural inlaid lid. 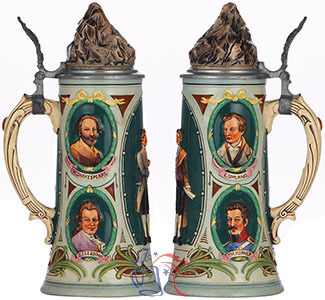 The central decoration on this stein shows full-length relief portraits of Johann Wolfgang von Goethe (1749-1832) and Friedrich von Schiller (1759-1805). Goethe is perhaps best remembered today for his classic play Faust, Schiller for his An die Freude (Ode to Joy), later set to music by Ludwig van Beethoven in his Choral Symphony. Side images depict Ludwig Uhland, Theodor Körner, William Shakespeare and Gotthold Lessing.